Kilbarron, Kilbeggan, Kilbride, Kilcarragh. Kilcommon, Kildalkey, Kildare, Kildorrery. Kilfithmone, Kilgarriff, Kilkee, Kildeedy. Ah, Kilkenny! I know that one. Wow, there are a lot of Kils in Ireland. Stupid me thought "Kil" might have something to do with a kiln, but of course that's wrong. It's Gaelic for church or cell--and from my reading I assume this refers to a monastic cell. Maybe. Today, we're off to Kilkenny and Kilkarney. It's a beautiful day, bright sunny and green--an incredible day for a drive through the country on incredibly narrow roads made claustrophobic and just a tad treacherous by thriving hedges and bushes that seem to choke the road with their quaint country exuberance. It is beautiful, though. Most of the way from Dublin to Kilkenny is an easy drive on the motorway. You can see almost as many sheep, ruins and trees choked by climbing plants from there, but you won't really have the feeling that you're risking your life in a jungle of creeping vegetation until you reach the country roads. After ten pop songs, lots of hilarious radio announcer banter, two radio shows devoted to solving people's problems, and (oddly but also in a way endearing) the obituaries, we reach Kilkenny. As usual, what I know about the town is restricted to alcohol. 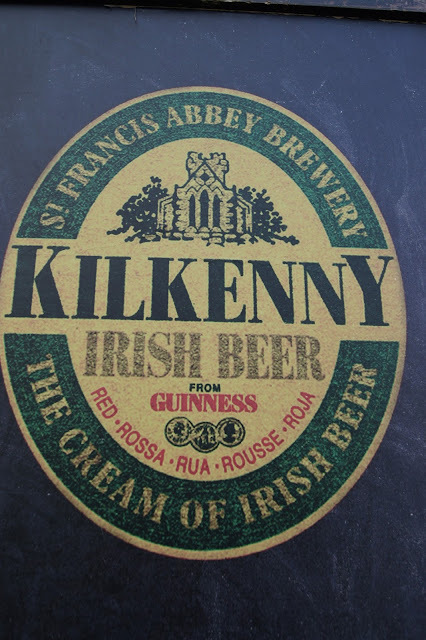 In the days when I didn't know I couldn't drink beer, I had a few Kilkennys at various Irish pubs. It's a red beer as the picture above indicates in five languages. That's it: Kilkenny is the place where they make the red beer. But now I am smarter. Kilkenny was named after St. Cainneach of Aghaboe, or Canice, which sounds like a woman but is really a man who died in the year 598; so, while you may have thought it meant the church of Kenny, the name really means the church or chapel of St. Canice. Actually, St. Canice is known as St. Kenneth in Scotland, where he lived for a while and built a church in what is now known as St. Andrews. But enough history. Kilkenny is an easy city to explore on foot. Like almost all Irish towns, it's quaint and has a castle or a church in the middle. 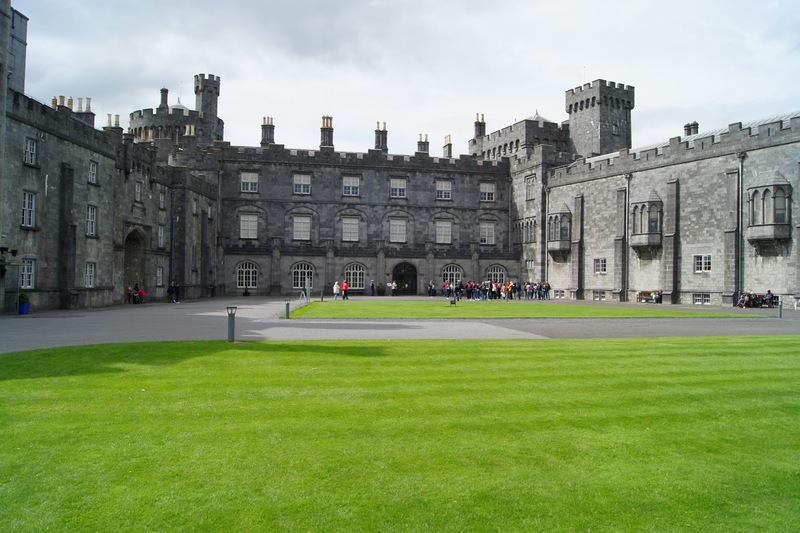 The Kilkenny Castle is a welcoming and stately place with a lawn dappled with locals enjoying the sun despite the "Please Keep Off the Grass" signs. The architecture is 12-century Norman, and the bathrooms in the right wing on the second floor as you're looking at the castle (you can reach them without buying a ticket to view the castle, but probably not after thousands of people read this). On the left as you're looking at the castle is a room with a free video explaining the history of Kilkenny Castle; in the turret on the right is a tearoom that serves the usual snacks. The pearl of the castle, though, is its expansive lawn. 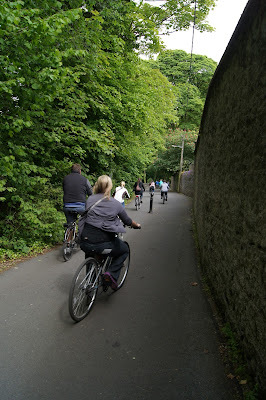 If you want to see more of Kilkenny and you enjoy a bit of lazy cycling, you can join a group with a guide. I saw several of these groups on the path along the river Nore. I didn't do this, but I did walk very slowly when they were stopped once to listen to the guide. 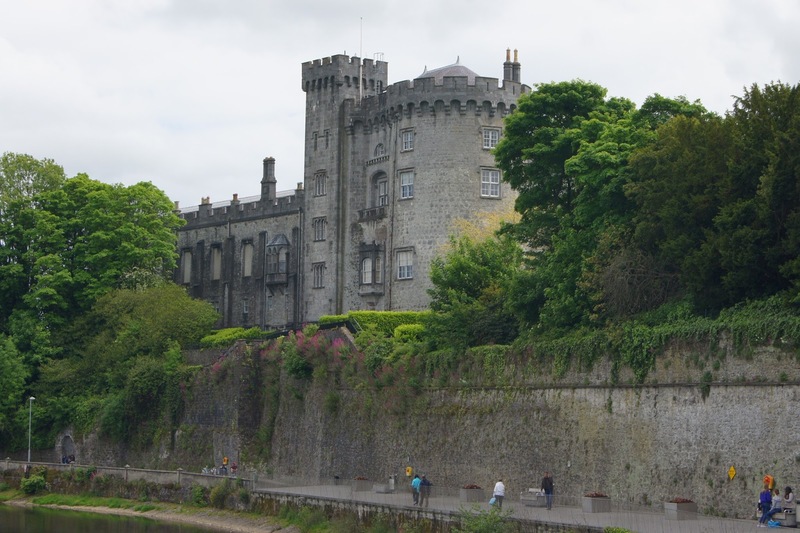 If you simply want to enjoy a nice walk and see a bit of the natural surroundings of Kilkenny, start your walk below the castle and walk along the river. There are also a couple of opportunities to walk up to the castle and that beautiful lawn. Before I drive on to Killarney, there's just one more thing to mention: the music. There's no shortage of music in Ireland, and Kilkenny is no different. You can't walk three meters in the old town of Kilkenny without hearing music coming from a pub, some second-storey window or a traditional Irish singer on the street. Ireland sings. And maybe that's my first reason for loving this place so much. Yes, all the green and the sheep and the 5000-year-old ruins are nice, but the music is what gets me. I have no idea how many pop songs Killarney is from Kilkenny. I'm too distracted (read: scared out of my mind) to count. The roads seem to get narrower and narrower as we drive west. We laugh nervously at the 100-kph speed limit. Who could drive that fast on these curvy, pencil-thin roads? How many times do I flinch as branches from the encroaching hedges swipe the car? How many times do I duck passing mirrors from oncoming cars? I will lie and tell you not once. We reach Killarney a bit harried. I need a cider. I need to get out of the car. Actually, I need to get out of the car so bad that I forget and leave my camera there. If you want pictures of Killarney, here they are. Walking through the old town calms me. There's music everywhere, and I mean everywhere. Live music, live music, and more live music comes from every door and window in these colorful houses. And there's going to be a beer festival tomorrow. Killarney is hopping--it's the place to be--and I've never known anything about it except that it sounds good in a limerick. So of course before I came here, I didn't know Killarney means "church of sloes," and this doesn't really tell me much either. I know what sloes are--they're a fruit similar to a plum that some people combine with gin to make sloe gin--but this brings me no closer to understanding the history of sloes in this region. So there you are: Killarney: church of fruit similar to plums. The region around Killarney is known for its natural beauty and rich history. I was here with my father years ago. We drove around The Ring of Kerry, and sadly we weren't that impressed. Still, partly because of its proximity to this region, Killarney was named Ireland's most visited town in 2015. And its accolades also include Ireland's tidiest town. This all sounds great, but I'm just here to hear the music. In the evening, we have a few ciders and listen to a guy sing Irish tunes but also some American favorites for the tourists. It's all good fun, but I wish people would learn new songs. It seems you can't go to a pub on this planet without hearing "Country Roads" at least once. 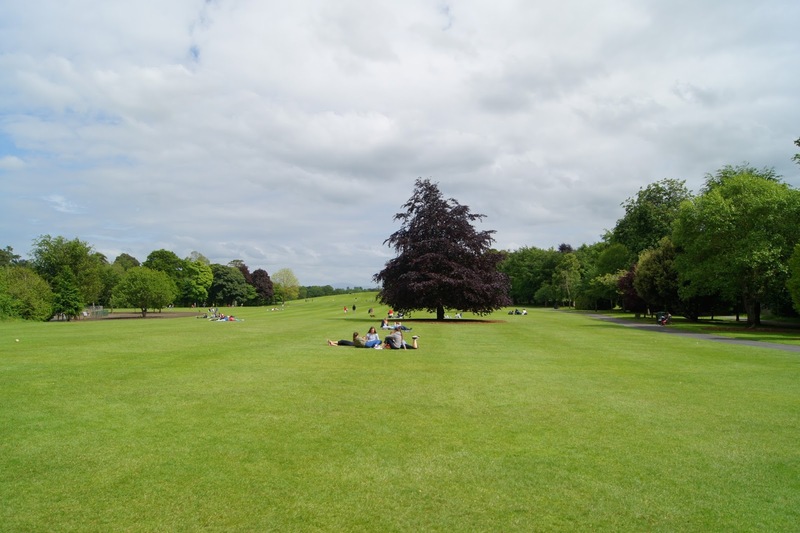 Have you been to Kilkenny or Killarney--or any other Kil in Ireland? I'd love to hear your recommendations about what to do in these towns. I'll certainly be going back. Hey, adorable I Must Be Off! readers! Have you entered the 2015 I Must Be Off! Travel Essay Contest? It's free! Have a look at the contest page. You have--as of today June 19--less than a month to enter. Also, I recently won the Ginosko Literary Journal's Flash Fiction Award. Yay! You can read the story HERE. And recently, Gravel Literary Magazine published my story "Birdie's Knowledge of Signs"! Have a READ. Christopher Allen is the author of Conversations with S. Teri O'Type (a Satire), an episodic adult cartoon about a man struggling with expectations. Allen's writing has appeared in Indiana Review, Night Train, Quiddity, SmokeLong Quarterly: the Best of the First Ten Years anthology, Prime Number Magazine, Contrary, [PANK] blog, Necessary Fiction, Word Riot, Bootsnall Travel, Chicken Soup for the Soul and lots of other good places. A finalist at Glimmer Train in 2011, Allen has been nominated for Best of the Net and the Pushcart Prize twice. RED Beer, huh?! Who knew? I haven't any recommendations to offer you, but I enjoyed reading about it. I don't know why the pop song isn't immediately adopted as a valid measurement scale between towns - it makes perfect sense to me!! Of course most driving in OZ would require whole albums, if not opuses (is that a plural??) so it might not work down here! Have a great weekend! A lovely evocative post for this reader with ancestors from Ireland. Thanks for the interesting article, i love Ireland. Killarney is amazing! And look at that castle! I love ruins but from time to time I like to see a castle that it's still standing... like this one... wow! It's definitely a lovely one. Thanks for stopping by, Laura!